There is something unique about HTC smartphone designs that blend style with quality. 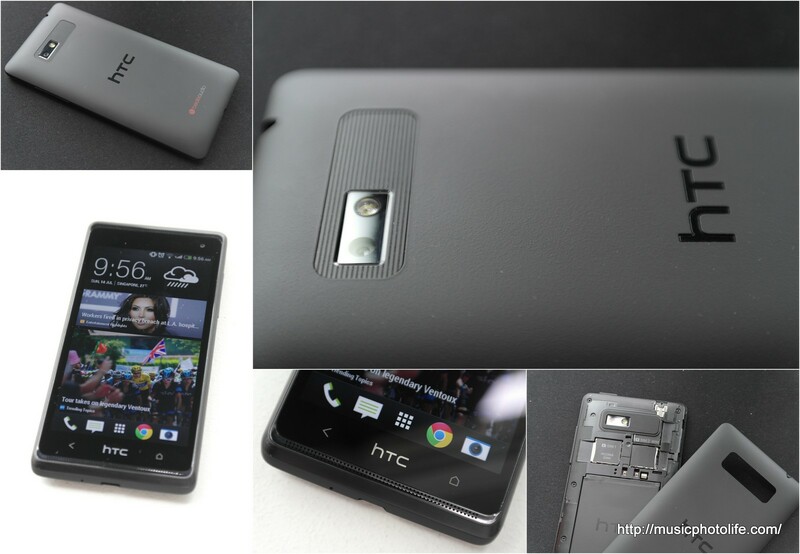 The recent review units that I received from them, HTC Butterfly s and HTC Desire 600, are good examples. The black HTC Desire 600 I had for this review uses a rough matt material finishing for its rear removable cover, offering slip-free, grease-free, fingerprint-free experience. It may be small and lightweight, but it offers 4-core 1.2GHz speed, adequate for daily use. Upon removing the tough rear cover, you will find the 1860mAh removable battery and slots for 2 micro SIM cards and microSD card. Power button is on the top of the phone, a placement that I do not like as it is hard to reach to turn on the phone with one hand. The 8 megapixel camera with f/2.0 26mm lens provides adequate resolution for image clarity, though images turn out slightly under-exposed and flat. Fans of HTC Video Highlights will be pleased to find that HTC Desire 600 can produce the same 30-second video clips easily for sharing, though you can’t capture HTC Zoe with this camera. Just like HTC One, the HTC Desire 600 comes with dual frontal stereo speakers that easily trumps other brand phones. The 4.5-inch 960×540 “Super LCD 2” screen, however, isn’t stellar. After getting too used to high ppi screens, one might notice the on-screen text are not as polished. The colour tone is also slightly cooler compared to the HTC Butterfly s. While the built-in 8GB storage might not be sufficient for many, microSD card up to 64GB may be added to expand the storage space. The HTC Desire 600 runs on similar HTC Sense 5 as the highly-acclaimed HTC One, with identical 2 soft buttons, so you get to experience the higher-end device. The HTC BlinkFeed is a convenient way to receive news feeds from the customised sources you pick, including your own social sites. It also displays your daily calendar information so you don’t miss your appointments. Transferring content from your old phone to the HTC Desire 600 is simple, thanks to the built-in “Transfer Content” feature that offers wizard guides and software to get you up to speed with your new phone. Of course, the star feature of the Desire 600 is the dual SIM capability. Unlike many dual SIM devices in the market, the Desire 600 allows both SIMs to be active at the same time. 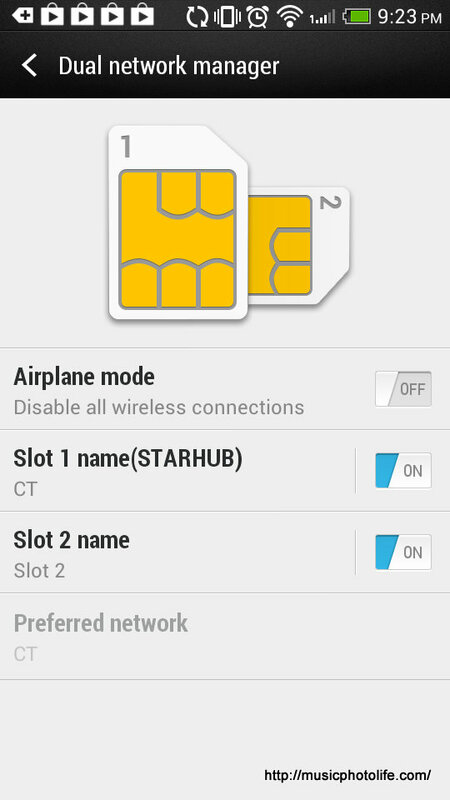 Call management is easy after you specify a unique slot name for each SIM (e.g “Work”, “Pers”). You can easily select which SIM to make the outgoing call or send SMS on the respective call or SMS screens. You can assign different ringtones for each SIM card. Call logs can be filtered by individual SIM in case you want to track separately. Dual SIM smartphones are not popular in Singapore compared to other countries even though many consumers hold multiple mobile numbers, and one major reason could be the variety of devices. While I would prefer to carry 2 devices for redundancy, having 2 numbers in one phone has immense benefits for people who needs simplicity in their life – simplicity of having just one device for their personal and office contacts to reach them. However, it might drain the battery a little faster, and fortunately for Desire 600, you can get extra batteries to last the day if needed. If you want a dual SIM smartphone that is not run-of-the-mill, then HTC Desire 600 could be the one to get. It offers the stellar features of the HTC One with the benefits of dual SIM at an affordable price. It won’t blow you away with its humble hardware specs but it is certainly no pushover. With the HTC Desire 600, you can finally own a decent dual SIM smartphone without sacrificing quality and looks. Retailing for S$498, the HTC Desire 600 is available at independent electronic outlets. The article is also published on XINMSN.